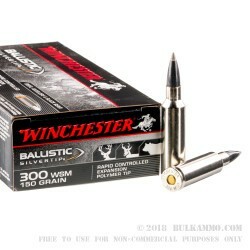 This 300 Win Short Mag cartridge by Winchester features a 150 grain Ballistic Silvertip projectile. 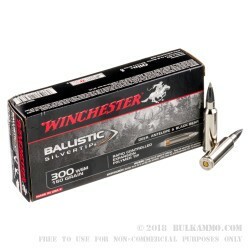 Winchester’s proprietary Ballistic Silvertip bullet is laden with performance enhancing features, such as its polymer tip that resists deformation, maximizes long-range performance, and promotes expansion within targets. Its alloyed lead core permits deep penetration by increasing weight retention, and its contoured jacket even further controls expansion. This bullet’s boat tail design ups its accuracy, and also gives it some resistance to the deleterious effects of cross winds. 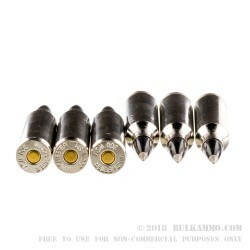 Finally, this bullet’s Lubalox coating does more than give it its sleek appearance -- it also reduces engraving forces and fouling within the barrel. Whether you’re going hunting for moose, black bear, brown bear, or elk, this is a cartridge that simply won’t let you down. 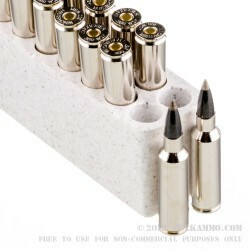 This round’s brass casing sports a nickel plating, so it has superior resistance to corrosion and will eject efficiently in your semi-automatic or bolt action rifle. With its Boxer primer it’s completely reloadable, so you’ll be able to keep this very valuable casing in play for a long time, courtesy of your reloading bench.